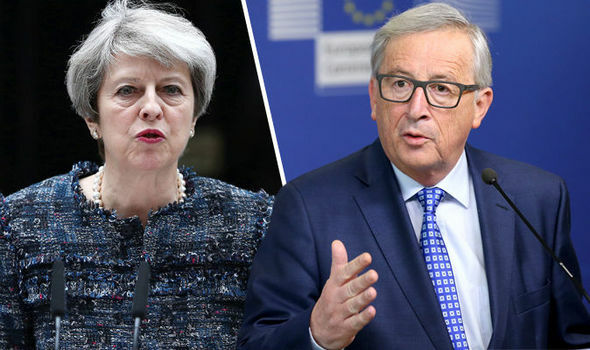 BRUSSELS has insisted that Britain has no right to a share of the EU’s assets as the furious row over the spiralling amount of a final Brexit bill intensifies. Barnier BLASTS 'illusion' of Brexit costs Back. Eurocrats said the UK, which has been one of the bloc’s biggest net contributors for decades, does not own a stake in its sprawling empire worth hundreds of billions of pounds. They insisted that the club’s gargantuan assets sheet, which includes buildings, loans, wine and fine art, is owned exclusively by Brussels and not the member states. The Government had been hoping to use the argument that the UK’s share of the bloc’s assets should be factored into the final Brexit bill to bring it well below the suggested £85 billion. But senior EU officials are not prepared to budge an inch and have dismissed suggestions that a compromise should be made, insisting their legal case is watertight. Ukip leader Paul Nuttall, who has argued that the EU actually owes Britain money due to the UK’s decades of net payments, said the stance showed the “appalling cheek” of eurocrats. He told express.co.uk: “The appalling cheek of these people is absolutely breath-taking. You could hardly make it up. “They spout similar ideas to Corporatist spin doctors, ie that a company's profits are private but its losses are public. “Of course the UK has a call on the assets. The UK taxpayer paid for the buildings, the financial resources etc and in negotiations we have a duty to demand them back from the money –grabbing EU. “And by the way, if they claim that their assets belong solely to the EU, so too must their liabilities." A senior EU official authorised to speak about the Brexit bill said that because the bloc is a “legal personality” in its own right member states have given up all claim to its assets even though they paid for them. The Commission bigwig, who is a top figure in Michel Barnier's negotiating team, stated: "Member states do not have any right to those assets, there’s no shareholding in the EU. “All of the EU’s assets belong to the EU and that includes buildings and other assets both tangible and intangible, financial and non financial, drinkable and non drinkable." Britain contributes around £10 billion a year net to the EU budget, money which has been spent on stunning displays of largesse and vanity that have enraged UK taxpayers. Just today the EU officially opened its House of European History museum, an initiative that cost an eye-watering £50 million but which has been criticised as a massive white elephant. The bloc owns a staggering £36 billion in property and cash including its £300 million ‘space egg’ Europa building, which is the new home of the European Council. Britain has also made considerable contributions to the European Investment Bank, which lends money to EU states, and which has an astonishing £56 billion in capital. Finally there is the bloc’s world famous wine cellar, which contains 42,500 bottles of premium plonk, and its burgeoning modern art collection, now valued at around £15 million. Verhofstadt said at the end of this video that like in a divorce, both debt AND assets must be on the table. Barnier however,claims that ALL assets belong to Brussels/EU and is not later shareable with anyone,only the DEBT? They do not seem to agree?